Here’s Day 2 of The St. Anne Novena! Blessed St Anne and St Joachim bless all my family and friends. Special prayers for Trevor that he may find the true answer to cure his cancer. In the name of the father.Amen. Bless my husband Keith and make me more loving towards him. Bless all my family blessed St Anne and St Joachim. In the name of the father.Amen. Blessed St Anne and St Jhoachim help we be more understanding of my husband and his needs. Help him become more sociable. Bless all my family as they holiday. In the name of the father. Amen. St.Anne please pray for the healing of mommy and nanay who are now qboth in bed and sick. Please also pray for our healing that we may be able to accept and overcome this week’s struggles especially in dealing both of thier situation. Please also pray that God may continue to protect and forgive us especially in all our shorcomings and mistakes. May you forgive me for being lazy and sometimes forgetting my everyday prayers. Thank you for today’s blessings. Amen. 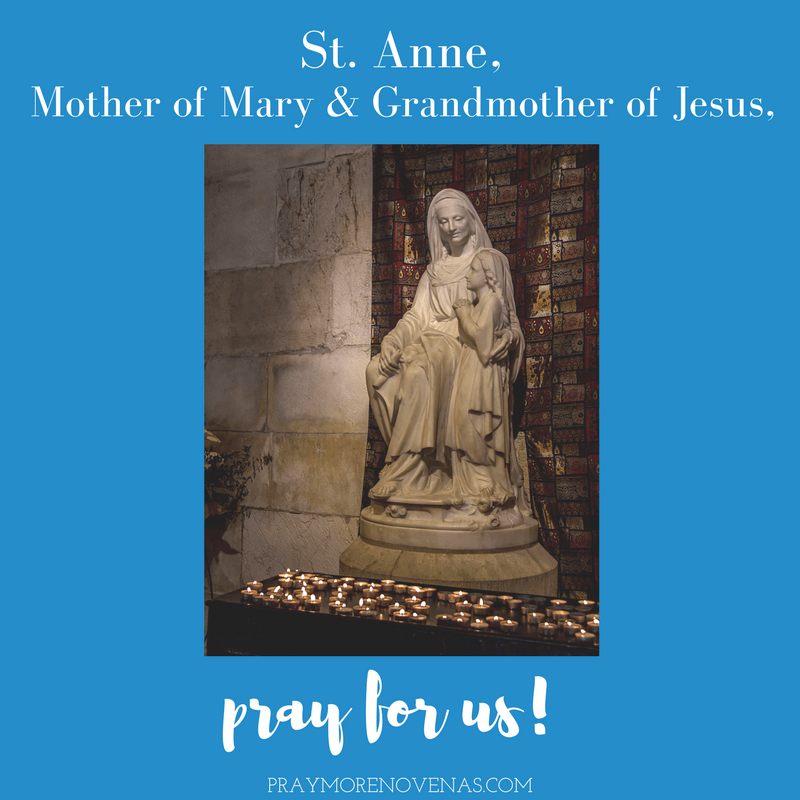 St. Anne praying for my husband who is being accused, for freedom and my family for our immigration process, healing for my mother on wheel chair and most of all to help me understand and love God more. As a young boy, I remember my mom and dad being very close to St. Anne. One summer we took a family trip (10 of us) to the St Anne cathedral in Canada. It left a marked impression on me. Today at 65, I am plagued with peripheral neuropathy in my legs and my feet, and after 18 months of searching, the cause still cannot be found. I love these novenas, and this current one to St Anne is especially near and dear to me. I am praying for healing of this chronic pain. For this issue, as well as improvements in my marriage, and hopes that our family will become closer to Jesus, I am in prayer to St Anne. For those reading this, I thank you for your thoughts and prayers as well. For all those who asked me to pray for them and for all those I promised to pray for. Please intercede for me. May my husband , family and friends be healed. May my husband be more patient and less anxious. May we always pray for what is right. May we stay focused on our Christian values. Be charitable and especially to those less fortunate, and have patience always. May my husband and I grow deeper in holiness. May our finances improve and may my husband and I get some work soon in Jesus Holy Name. We have much to pray about and God knows ever heart. Pray for Marie with her foot problems, and her brother, Louis as he prepare for another operation in his long journey of recovery. Watch over Louis’s family as they await for improved results. Praying for my nephew, Joe, his brothers and his parents. May Joe grow with a stronger faith, and divine knowledge, a deeper wisdom to change his ways for the better and be a devout Catholic, in Jesus holy name. Pray that Veronica will have a hunger to know and serve God. Pray for her family members to return to the faith..Amen. I graciously ask for your intercession to help in the facilitation of the joining of myself to my husband who God has created for me. I ask the same for my sister and friend. I am forever grateful to our heavenly Father for all my blessings, and for blessings to come. Dear St. Anne I pray for a special blessing of the new union of my cousin and his wife, may their union be filled with love and happiness. May their union grow in faithfulness, give them strength and courage to face any difficulties that may come their way. May they live in peace with their families and embrace the love of their parents.Most of all let their union be a joy not only to them but to their entire family despite the hurt feelings. In Jesus name. Amen. Please be my advocate and pray to Jesus for my son and his wife to start a family. Please pray that for finances for my husband and myself to be returned to us. My son will find a job soon. I will be in Canada by next year for God will and bless my family, bosses, and work and all people joining this novena. Thank you for your prayers. Amen. Please pray for me to find a God Fearing Catholic man for my husband. Also, my cousin April Lynn has not been able to conceive a baby in years. She is 37 years old. St. Anne, I ask for you to intercede for me & everyone crying out to you & out Father. I have been bedridden for 9ish. yrs. & I never lost Faith, please help us all to enjoy what our Father has for us. Please St Anne help my husband relax and lessen his frustration. Bless all my family and friends. In the name of the father. Amen. St. Anne, I pray for my sons to find holy, faithful, Catholic women, if that be God’s will. That they give their lives to the service of Holy Mother Church. May His will be done. My son in law find a job. St. Anne……….I humbly pray for our oldest son that he will be successful in his job, and be blessed with a nice catholic lady to be his future wife. I pray for our middle son who is struggling with depression/anxiety, please bless him that he will seek the guidance of counseling/doctors to help him. Please bless him with a good job to keep him busy. I pray for our daughter that this medicine she is taking will heal her pituitary tumor and that she too will be successful in her new job. We adore you, and thank you so very much for your prayers. Please save Jean Sybil Kuku and Mona for ever. Blessed St. Anne please intercede for my daughter to meet the perfect husband. A practicing Catholic man who will be with her for the rest of their lives in a fulfilling and happy marriage. A man that has purity of heart, plus a nature and character that is gracious, kind, giving, and loving and also that they will always be attracted to one another in a way that is lasting. Blessed St. Anne thank you in advance for interceding for me. I pray for a job that will allow a flex schedule. I pray for restoration in my marriage. I pray for strength and perseverance for my mom and my friend Kathy. I pray that my husband will get the financial assistance he needs to finish his big project which will open doors of overflow for him. Blessed st Ann’s please intercede for me. I pray for money to finance my son throughout medical school. I pray for money to pay my son’s tuition fees which is now due. I pray for my marriage. I am praying for finacial assistance and protection in my home. I’m praying for my daughter to find a Catholic boyfriend and other Catholic friends who live the faith. It is so hard to live the faith when you’re young and no one else your age does. St Anne you know my needs I need a partner that can be my future soul who I will love. I pray dear St Anne through your intercession for my sons and spouse to truly realise the sacredness of marriage. For my sons be guided to the their true lifetime spouses as destined by the will of God. Happy and holy unions with the grace of God. Amen. Grandmama St. Anne please interceed for me and ask our heavenly Father to show me what path in life he has destined for me that is his will for me. If it is marriage and if it is to B to please restore us and pave the way for us and lead us to holy marriage. If not B to send the right spouse. If it is single life to show me. And if it is religious life to guide me to the right order I should belong. Grandmama Anne please also interceed for all on this site praying and ask God to grant their hearts desires that is his will for them. For John Paul and Annie’s special intentions as well, that is in accordance to God’s will for them. In the Mighty name of Jesus I pray. Amen! I ask that you pray for me to find the man of my Dreams, a man who is God-fearing and who will love me for me, who will respect me, care for me, be kind to me and everyone around me. A man who will be my FRIEND for life. I make this prayer through Christ our Lord for myself, family, friends, loved ones and everyone who has prayed this Novena with me.